One of the world’s foremost fingerstyle guitarists and harp-guitarists, Muriel Anderson is the first woman to have won the National Fingerstyle Guitar Championship. She has recorded with country legend Chet Atkins, performed with jazz greats Les Paul and Victor Wooten and with classical orchestras. Her recent CD Nightlight-Daylight placed first in its category in 11 national awards, and is the first ever to incorporate interactive fiber optics. Founder of the renowned Muriel Anderson’s ALL STAR GUITAR NIGHT®, she enjoys sharing her joy of music via her charity, the MUSIC-FOR-LIFE ALLIANCE. Her new concert program “Wonderlust” is a must-see as well as a must-hear! It includes visuals – moving and still images artfully compiled by brilliant photo-artist Bryan Allen. Composer, guitarist, and harp guitarist Muriel Anderson is one of the few world-class musicians equally at home with classical, bluegrass, fingerstyle and international music. 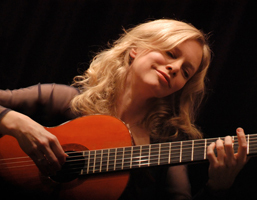 Her obvious joy of music, humor and her facility across the genres of folk, classical, jazz, bluegrass and international music is revered by guitarists worldwide. An engaging performer, Muriel’s unique approach to the instrument virtually transforms the guitar into a lyrical choir, then a marching band, then a Japanese koto, then a Bluegrass band, one minute launching into a Beatles’ tune and the next, a Rodrigo concerto. Her gentle sense of humor and her facility across multiple genres of music is revered by guitarists worldwide. She has performed at Chicago’s Orchestra Hall with the Chicago Symphony and in Tennessee with the Nashville Chamber Orchestra. Her “Heartstrings” cassette traveled into space, accompanying astronaut Susan Helms for 2.3 million miles on the space shuttle “Discovery.” Muriel’s music can also be heard in Woody Allen’s film Vicky Cristina Barcelona. She enjoys touring as is evidenced by her “photos from the road” and “recipes from the road” on her website. Her new double CD Nightlight Daylight is a culmination of her creative spirit, and as of this week has garnered 11 national awards, top honors in each. It is the first CD to incorporate fiber optics in the packaging, her idea brought to life by photo-artist Bryan Allen. Muriel fell in love with the guitar at an early age and learned every style available to her, beginning with folk, bluegrass, and then jazz in high school. She received a degree in music from DePaul University and went on to study with classical virtuoso Christopher Parkening and with Nashville legend Chet Atkins. She has composed music since about age five, and has written solo instrumentals and vocals, choral and orchestral compositions. She tours frequently with German duo TIERRA NEGRA. Their CD together, “New World Flamenco,” has been met with rave reviews. Muriel has published articles in Guitar Player, Acoustic Guitar, Fingerstyle Guitar, Classical Guitar and Frets magazines, and is currently a regular columnist for Acoustic Guitar Japan magazine. She is a regular guest instructor for Truefire and at guitar workshops across the country. Some workshops are sponsored by her GHS Signature strings. She plays many handmade instruments and endorses Morris Guitars in Japan, as well as Seymour Duncan D-Tar pickups.